Recently Samsung has launched their new devices, Galaxy On5 and On7, both the devices are budget phones and target the mid-range market. Galaxy On7 is priced at Rs. 10,990 and comes in two colour variant, i.e. Black and Gold. As it is a mid-range phone, the hardware specifications are average without any particular features that can attract customers to put their finger on this phone. 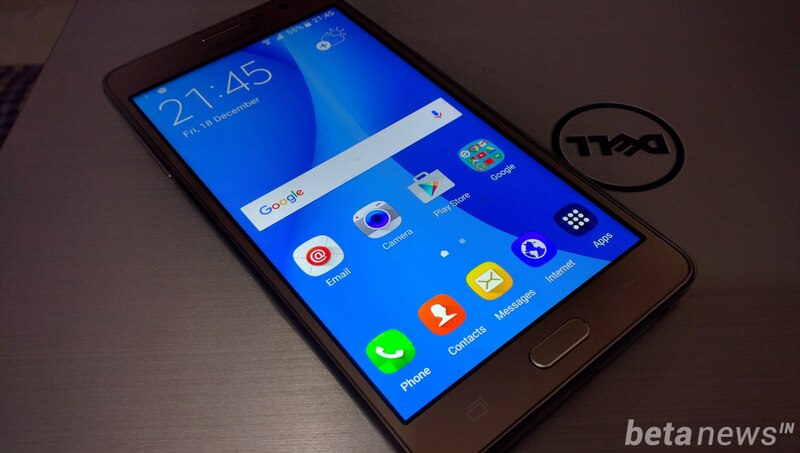 Though the Samsung lovers may opt for this phone due to its big screen size, bigger battery and less price. So let’s have our take on this new smartphone from Samsung. As soon as we opened the package, an orange box with minimal text is visible to us. The front side of the box has only printed the name of the phone to a great font size. 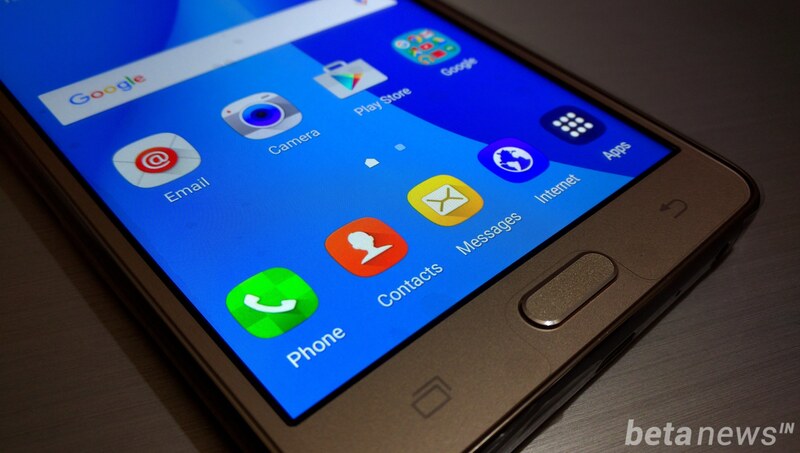 Overall, Samsung has adopted the minimal approach in the boxing of Galaxy On7. Removing the outer cover of the box unfolded the big and beautiful On7 with an adapter, data cable, user guide, battery and earphone beneath the phone. The adapter that is supplied with the phone has an output of 1.0A, which is undoubtedly small for a massive 3000 mAh battery and you have to wait a bit longer to charge your phone from 0 to 100%. The stereo earphones are very basic, and you can’t expect a great thump and bass from them. There is also a quick start guide for newbies that has very basic tutorials on how to use Galaxy On7 for the first time. 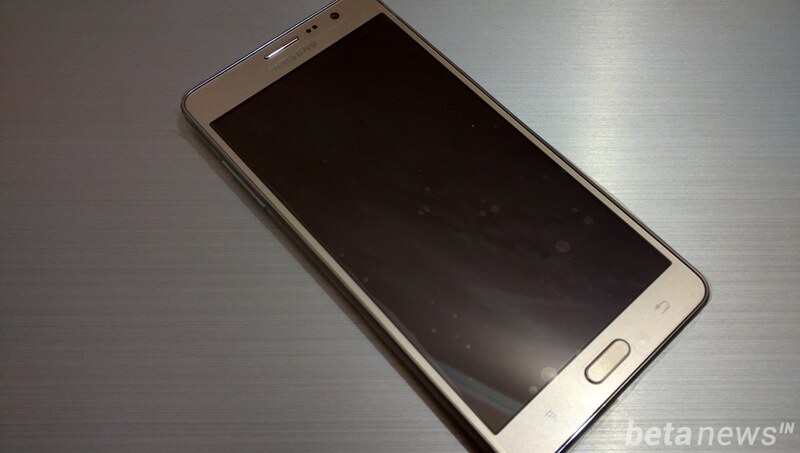 The design of On7 is similar to other mid-end smartphones from Samsung. “No new concept for new smartphones, just a new name and a slight variation in hardware specifications“, this is the principle rule of Samsung for all their smartphones except the flagship and top end devices. The build quality of On7 is average and reminds me of their old Galaxy S series phones that have a complete plastic body. 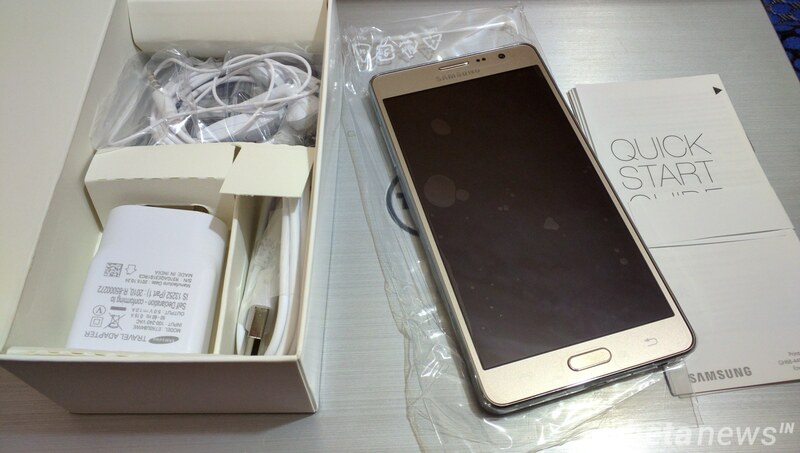 It looks eye-candy and sturdy at unboxing but after a couple of months the colour from the side frames get wiped out and a black colour phone become white from all sides, though this time, we have a gold colour device. 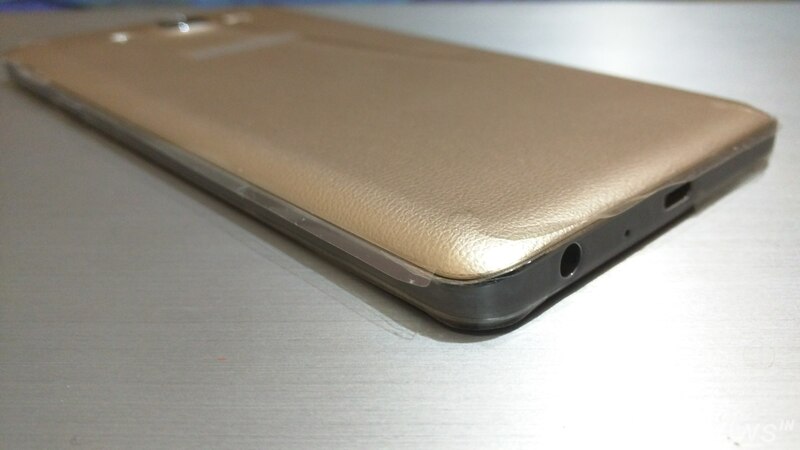 On the front aspect of the phone, there is a massive 5.5-inch screen with a front camera at the top right. The phone has hardware touch buttons at the bottom with a big home button at the middle. On the back side, there is a 13 MP primary camera with a LED flash on its left and a speaker on the right. 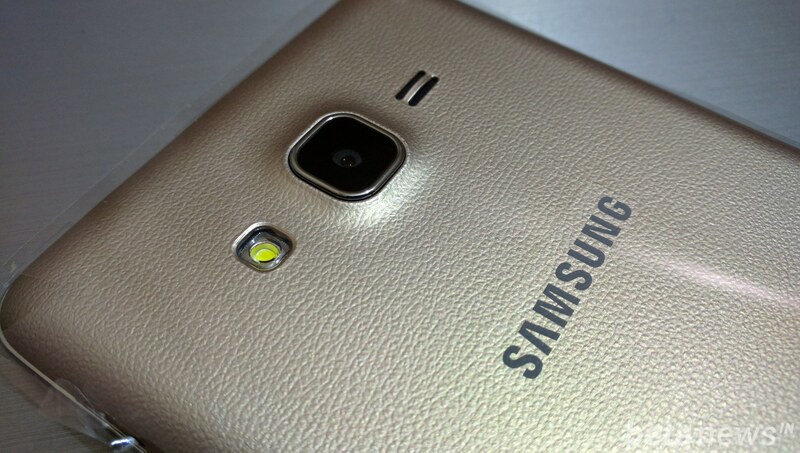 Just below the camera, there is a SAMSUNG logo; a similar logo is also placed at the front top. On the left side there resides a volume rocker button and on the right, there is the main power button. At the bottom, there is a micro USB port with a mic and a 3.5 mm jack. The top side of the phone is bare empty. 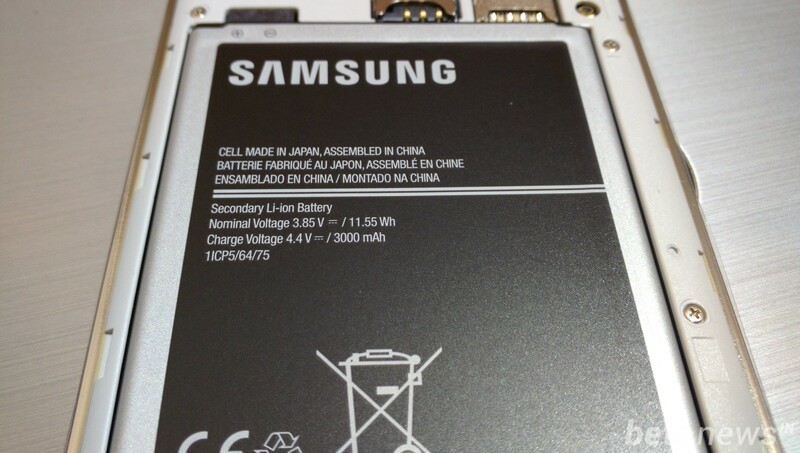 The back cover of the phone is removable, and there is a place for the battery, SIM card and micro SD card. In short, you will get what you have paid. 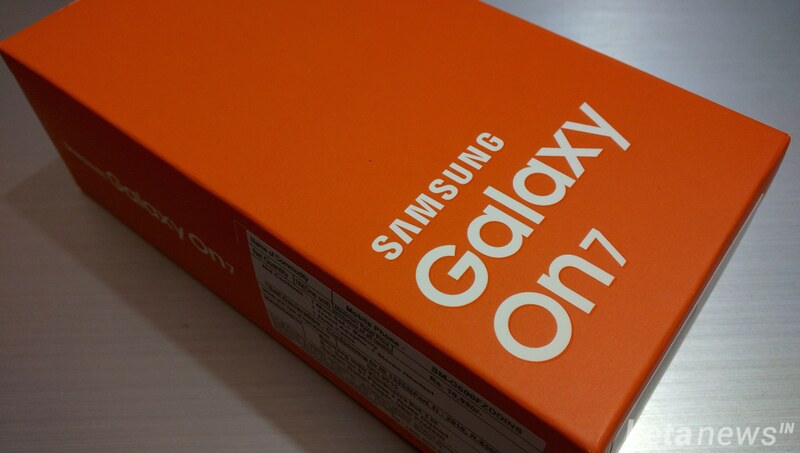 On7 is a budget phone, and you will only get a basic smartphone from Samsung with a new name and branding. Though I must say that the hand feel of this phone is great instead of such a big screen (it might be because I am used to 6-inch screen of Nexus 6). Before buying this phone, make sure that it is comfortable in your hands. Galaxy On7 features a 5.5 inch TFT screen (no AMOLED this time) with a resolution of 720 x 1280 pixels, which makes it 267 pixels per inch. No need to say that Samsung has decided to cut down the prices of the device by cutting down the screen quality. No personal conflicts, but Lenovo (K3 Note) provide a full HD display with a resolution of 1080 x 1920 pixels for Rs. 1000 less, of course, even with a better hardware configuration. The screen is bright but not crisp as other phones in this range. You can easily get a better deal than On7 at this price. A 720p resolution on a 5.5-inch screen is not a good choice if you love to watch movies and videos on your smartphone. Samsung is always known for its good camera, and On7 is no exception. It has a 13MP primary camera with LED flash at the back. Keeping in mind that On7 is a budget phone, the camera is up to the mark. It also has Geo-tagging, touch focus, face detection and auto-focus features; that improves the photography experience from this phone. You can even shoot videos at 1080p at 30fps with the primary camera. When it comes to the front camera, On7 has a 5 MP selfie camera, and it does its job quite well. The selfie images are clear and bright. Overall camera experience with On7 is good; it can serve the purpose of taking pictures of real lighting conditions. Galaxy On7 is powered by Quad-core 1.2 GHz processor accompanied with 1.5 GB RAM. The internal storage is 8GB, but it can be expanded up to 128 GB via micro SD card. 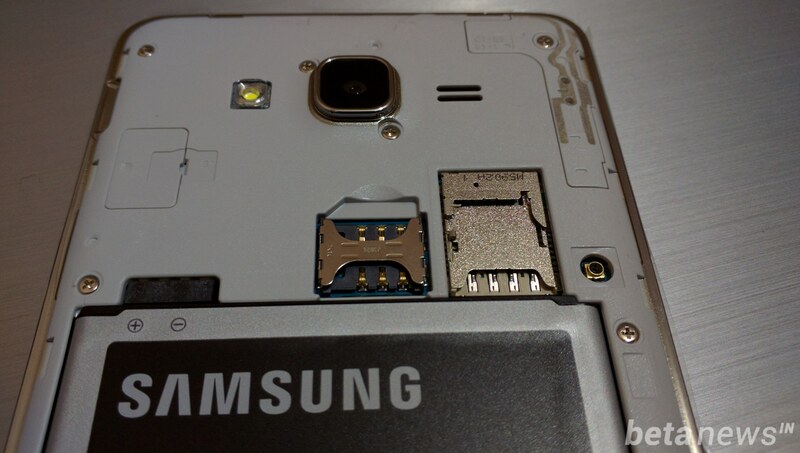 The phone has 2 SIM slots and a micro SD card slot above the second SIM slot. The phone seems smooth while using in typical day to day tasking. There is no lag at all while opening camera or keypad application, unlike old Samsung phones. Thankfully, On7 comes with an enormous 3000mAh battery (the only feature that makes this phone worth purchasing) which can give a long battery backup in a single charge, though it does not support quick charging. On7 has Wi-Fi 802.11 b/g/n, Wi-Fi Direct, hotspot, Bluetooth v4.1, GPS, FM Radio and a microUSB 2.0. NFC and infrared port are missing from the phone. Galaxy On7 runs on Android 5.1.1 Lollipop out of the box with TouchWiz on the top. Though as soon as we connected our phone to Wi-Fi connection, it started downloading a new software update of 56.38 MB which is just a minor performance upgrade. Like other Samsung phones, On7 also comes pre-loaded with Samsung Apps like S-Planner, Smart Manager, MixRadio and Opera Max. 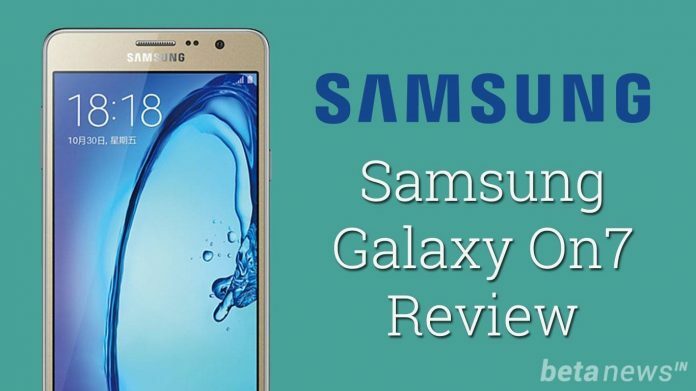 This year Samsung has improved a lot in their software department and has removed all the bloatware that they used to market as their features, and finally, it resulted in a smoother user experience. Samsung Galaxy On7 is priced at Rs. 10,990 and comes with average specifications with no perks and jerks. Practically you can get a better deal at this price, but if you a brand freak, then On7 is a perfect deal for you at this price tag. 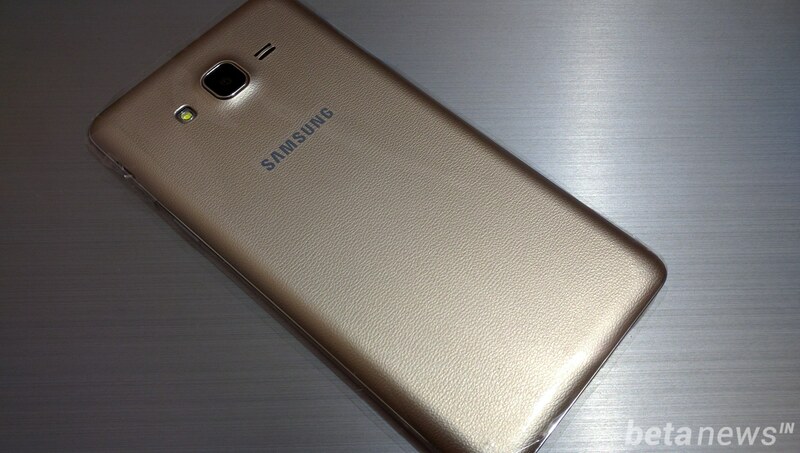 Samsung Galaxy On7 is a mid range budget phone with average specifications. If you are not a Samsung fan, than you can certainly skip this phone for a better and cheaper option.